The title comes from a book my Michael McDonald. You can find out more about the book here. I don't reference the book at all, I just like the title. I am trying to integrate a few ideas from various notebooks lately. What began with a spellcaster that carries around increasing amounts of junk to cast spells has retconned to a new encumbrance system based on stones instead of pounds. Let me back up a bit. I change my system of choice from time to time. Recently, I have shifted away from The Black Hack and back to Swords & Wizardry. I love the elegance of The Black Hack, but enjoy all the fiddly bits of S&W. I want those fiddly bits to present the way all magic works in my campaign world. 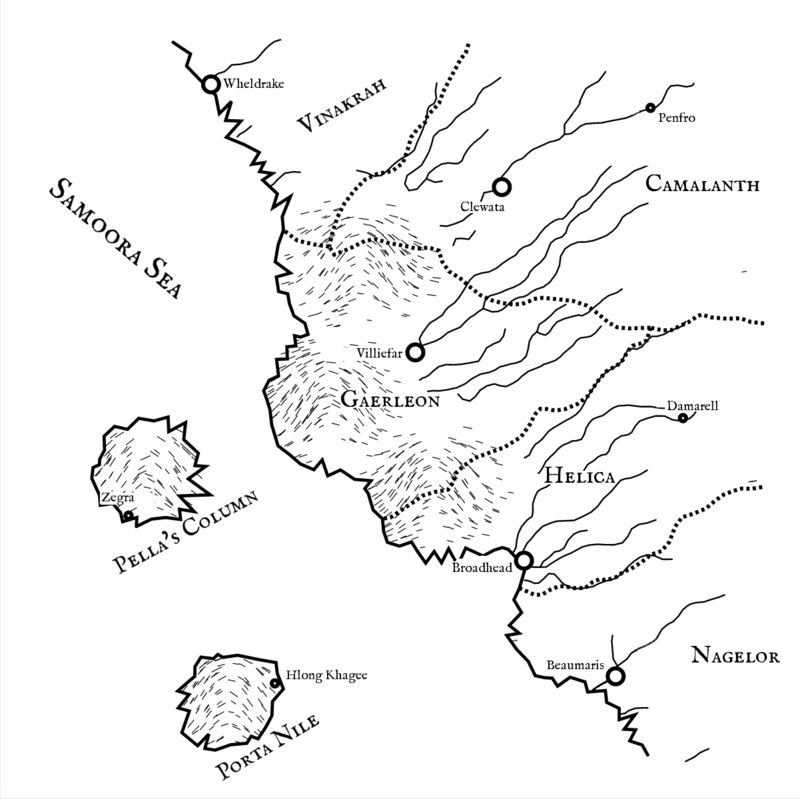 In my Samoora Sea campaign, one of the conceits is that arcane magic is regional and much less formalized. To demonstrate that, arcane spellcasting classes are mechanically different by region. Where a character is from is important to what the character can do and how they do it. One tradition of magic is intelligible to a spellcaster in a different tradition. If a character hails from Porta Nile, they gather bits of damaged arcane items scattered around the island to generate energy to power spells. They record their spells with alien runes. These arcane items are believed to be detritus from the alien crabmen's shining city. This type of magic developed as humans living there cobbled together whatever they could find to defend themselves from the crabmen. These are the spellcasters that triggered the need for a stone based encumbrance system to reduce bookkeeping for these characters. If a character hails from Gaerleon, they will use energy from the five salts to power their magic. Each salt has a different color and taste sensation (sweet, salty, bitter, sour, umami/savory). An apprentice mage learns to cast spells based on only one type of salt at a time. As they gain mastery over one type of salt, they learn about a different type of salt. After studying three types of salts, they gain the ability to combine two types of salt for more powerful spells. The Master Salt Mage can use a specific three-salt combination to power wondrous mechanical devices. In Helica, spellcasters are masters of time, luck, and travel. Ancient gates open doors to other countries, regions, planets, and dimensions. Fueled by the power of these gates and their mysterious energy, they work powerful magicks to build the fledgling Helican empire through trade with other worlds. A handful venture out in search of lost portals. In Nagelor, those that do not follow the warrior paths of their ancestors become Blood Thieves. A Blood Thief steals a bit of essence from a creature to fuel magic to alter or augment the spellcasters' own body. In their wake, the scourge of cypher beasts rage against all living creatures. Blood Thieves are distinctive due the equipment they use to steal a bit of essence. The large, but silent contraption is worn as a backpack connected to an obsidian bracer by a thin metal tube. As spellcasters travel throughout the region, they adapt based on what's available. For example, the five salts may not be available in some places, so a salt mage learns to glean power from other items (plants, crabman tech, blood, etc). Rogues exchange their Read Magic ability at 9th level for a Scribe ability that starts at 1st level. A rogue can write down a spell from any form of arcane magic to create a scroll or translate an arcane spell to another spellcasting tradition. For example, a rogue can write down a spell record from a Blood Thief to create a scroll. A rogue can also take a spell from a Porta Nile Runecaster and write it down in the form of a spell recipe that is understandable to a salt mage. At low levels, the chances of success are very low. This ability parallels the fiction of the world that trade between different countries has only recently been revitalized. As characters progress, they encounter new things and adapt what they can to become more powerful in this world. Scrolls may not be intelligible to the party's spellcaster, making a rogue invaluable. Clerics, though, are from an organization called the Hendenciad, the Group of 11. Mechanically, there isn't any difference from a standard S&W Cleric. Again, Clerics are the same, except that spells are broken up by deity instead of schools. The fiction says that a small token/negotiation with a specific deity is required to gain a spell. While playing the game, though, this doesn't need to be played out every time a divine spell is cast. Divine Magic is based on the story of the creator god, Samoora, and their three types of offspring. Collectively, all Samoora's children are called deities, though each one has a different title. The oldest are gods, the next are titans, and the third are kwemara. The gods and titans created intelligent creatures for the planets Samoora made. Each race claims a god or titan as a patron. In time, however, the gods and titans killed Samoora and the kwemara ran away to the stars. Each of the three have a different perspective as to how Samoora died. When the kwemara returned, they slaughtered many of the gods and almost all the titans out of vengeance. Before returning to the stars, the three offspring set up the Hendenciad, the group of 11, to watch over the world. In the group of 11 are 7 gods and 4 titans. The kwemara left a mysterious creature named the XO to oversee the gods and titans. The XO does not accept worship like the gods and titans, and so does not grant divine magic spells. No Cleric has determined any token, ritual, or negotiation to win the favor of the XO. An ancient caste of human Priests call themselves Canavarii, the Clan of the Wolf. They do not build temples, nor do they participate in the religion of the Hendenciad. They claim to be servants of the earth and often appear in numbers during times of great trouble. Their first appearance was marked thousands of years ago when metal-eating beasts threatened civilization. Their second appearance was born from the devastating armies of the Reanimators, horrible wizards that reanimated and reshaped the dead into horrific and fearsome warriors. Their current appearance, however, doesn't appear to be in reaction to any great calamity. Canavarii are present in every area of the region and are believed to have a presence everywhere in the world. Whenever a new land is discovered, invariably, the Canvarii appear to have been there already. They are respected, trusted, and revered. There has never been (nor will ever be) and evil or former Canavarus. Emissaries are a race of awakened dolphins that represent the Great Sea God (not a titan) on land. They wear self-contained suits that protect them from risks both environmental and violent. Disconcertingly, they hover on land as if swimming through the air. Their movement is an innate ability of these awakening dolphins and is not powered by their suit. They communicate telepathically, but cannot read minds. Their form of magic is unique and is unlike arcane or divine magic despite their connection to the Hendenciad. In Nagelor, the Sachima (dragon/tiger descendants) that choose the ancestral path of dragons employ magic centered around expelling magic from the mouth. In addition to various breath weapon magics are spells that begin with an exhalation of mystic energy. On Pella's Column, spellcasting refugees from the Western Continent lug around heavy spellbooks and devote themselves to endless hours of study to master magic. None of them came here by choice. Priests of alien gods gibber about the island unable to perform any magic save for minor healing spells. Most of them are mad, but harmless. Most of these spellcasters were marooned here after a shipwreck, the remaining ones came by way of a portal or a mishap in planar travel. Those that have not resigned themselves to be marooned in this region have already left the small island in search of a Helican portal that can take them back home. In Eastern Camalanth, the Cult of Hot Iron melds a zen-like tradition of pistols, ceremonial battles, and ki-fueled martial arts. Now to switch gears back to systems. At some point, I can backport all of this into The Black Hack, but it feels easier to start with Swords & Wizardry for now. I worked for a long time to get this working in The Black Hack, but it always seemed like the mechanics got in the way. I started creating my own private Greyhawk in middle school and S&W feels like the version of D&D I played starting in those years and throughout high school. I call all of this my own private Greyhawk because this will eventually link to my Tanah Con-Rahn (Indonesia) region, The Western Continent (my high school world), and Zyg (homeland of the advanced Naga and Garuda).